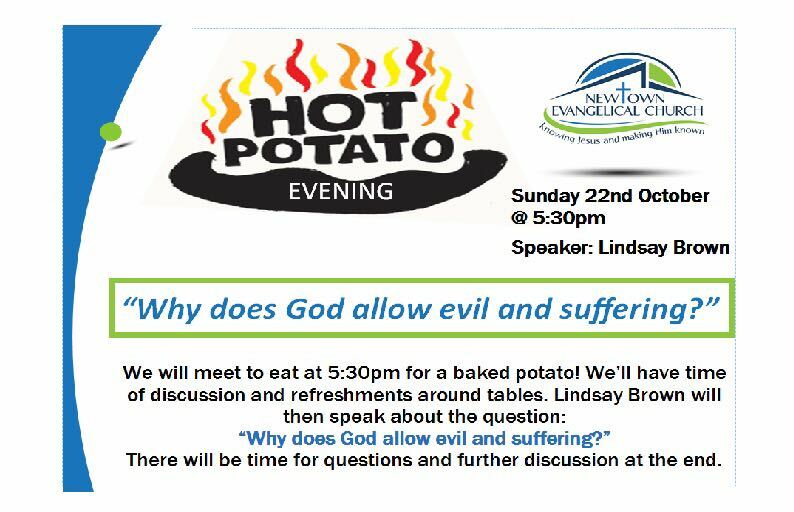 You are here: Home / Events / Hot Potato Evening: Why does God allow evil & suffering? If there is a God, and he’s a God of love, why is the world such a mess? Well, if this is a question that has crossed your mind, we’d love to invite you to join us on Sunday 22nd October where we’ll be joined by Lindsay Brown who will be seeking to answer it. 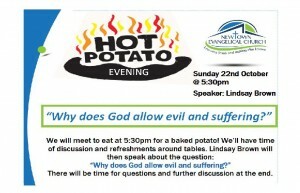 We’ll begin at 5:30pm by enjoying baked potatoes and time to discuss this big question, before Lindsay will speak. A time for questions will follow. The evening will be quite relaxed, children are very welcome to join us. If you have any questions or would like more info, please get in touch.